Where did Jibreel (AS) brought the Wahy from? 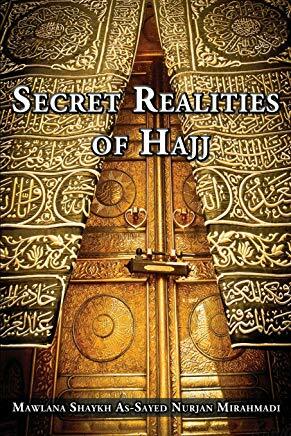 From the Realities of Mawlana Shaykh Hisham Kabbani (ق) as taught by Shaykh Nurjan Mirahmadi. We are all under the Ahl al Sunnah wal Jama’at, in different mazhab, Alhamdulillah, with different zawq (taste). That the mazhab means you keep your mazhab; you want to pray the way Imam Shafi teaches, Imam Hanafi, Imam Hanbali, Imam Maliki- no problem. Some of us are following the way of zawq, the way of the taste. From the shuyukh (spiritual masters), who came to perfect the character and said that, ‘Now that you learned all of your shari’a (jurisprudence), and you understandings of Islam, let us to come and perfect your akhlaq and your character, so that to make you to be sweet.’ And they are the Ahlel Muhabbat and the Ahlel Haqa’iq, and the real lovers of Sayyidina Muhammadﷺ. The lovers of Sayyidina Muhamamd ﷺ are huge in number, but silent. So it’s important that we come out in numbers and keep pushing the love of Sayyidina Muhammadﷺ, the way that we want to show our love. So Alhamdulillah that we come to these organizations, come to these mawlids. 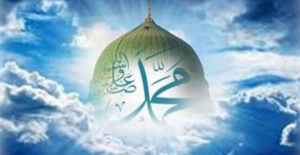 Anybody organize a mawlid and we all go to that mawlid, so that we can show that we should have 10 000, 15 000 in a mawlid,(celebration of Prophet Muhammad ﷺ’s birthday). Not only in national day that people come out in huge numbers, but they should be coming for love of Sayyidina Muhammadﷺ. 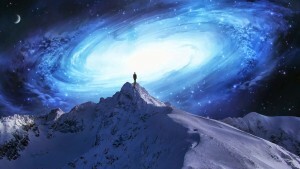 We are under tremendous amount of azab (difficulties) that is coming onto this dunya (material world). And awliyaullah (saints) are sending isharat to all masha’ikh (spiritual guides) that: do something that Allah (AJ) keep a rahmah above you, your family and your community. That your own amal and the actions that you do, Alhamdulillah, they may be good, they may be judged by Allah (AJ). But, what brings the rahmah and the fa’iz and the barakah in life is the love of Sayyidina Muhammadﷺ. When we do these associations, majlis, mahfils and zikrs (divine remembrance) and milads,(celebrations of birth of Prophet ﷺ), it brings Allah (AJ)’s Rahmah (mercy). That now you have attention of the heavens, because Allah (AJ) is happy that in this day, because we’re not talking about Lahore, we’re not talking about Afghanistan, we’re not talking about Indonesia where there’s 100 million Muslims. 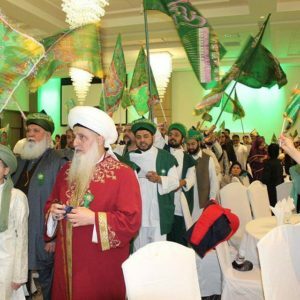 We are talking about Canada, we’re talking about Vancouver, that from the heavens they look and they say, ‘Look, they’re coming for mahfils, they’re coming for zikr, they’re coming for the love of Sayyidina Muhammadﷺ.’ Now you get heaven’s attention: Allah (AJ)’s Rahmah and Allah (AJ)’s Nazar is upon the associations because they love whom Allah (AJ) loves. That is a safety for ourselves, for our families, for our communities; and begin a tremendous dress of rahmah and blessings. That we have to increase the amount of love by these associations, by these practices, by all of what we’re trying to do in our collective communities. Then coming together to unify, to show that we are large in number. But we are not going to stay silent, we are not going to stay quiet, we’re not going to have to listen to their aqidah (belief). If a politician come, oh they dress their best. They say, ‘Oh we have now so and so coming,’ as if you’re going to get free money from that. You dress your best, you put your suit, you get all excited and you come running there shake a hand and take a photo. It is not of any value for us in akhirah. Allah (AJ) is going to say, ‘Were you with this person and all the crimes they committed?’ You say ‘Oh ya Rabbi (my Lord), I took just the photo for business sake, I’m not with them!’ Yeah. Then when you come and show ihtiram and you come and you love the shaykhs, you love their students, you love the lovers of Sayyidina Muhammadﷺ, they say, ‘ya Akhi, (oh brother) this is a shirk (polytheism).’ Are you crazy? What shirk? We’re worshiping Allah (AJ)! When we show ihtiram and love for each other and respect, this is what Prophetﷺ wanted for us. Prophet ﷺ wanted for us to respect each other, love each other, show kindness and gentleness to each other because this is Allah (AJ)’s Ni’mat and Favour, because prophet ﷺ is Khuluq al ‘Azim. 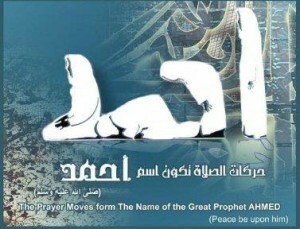 Allah (AJ) said Prophetﷺ is the one with the majestic character. Who Brought you the Holy Quran? Recently awliyaullah (saints) are opening up these realities and all this love for Prophetﷺ. 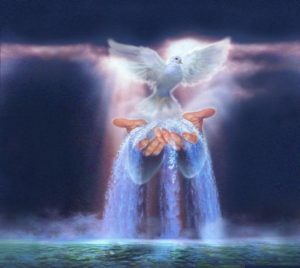 We pray that our hearts open more and more for that love and that understanding. To understand the greatness of our prophet ﷺ. 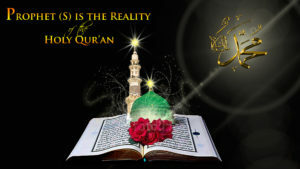 As they respect holy Qur’an and we respect holy Qur’an – we just go a drop into the oceans of realities, because some people may not understand the reality. When Sayyidina Jibreel (AS) was bringing wahy (revelation) to Sayyidina Muhammadﷺ, Prophetﷺ asked, ‘Ya Jibreel, where you get your wahy from?’ He ﷺ wants to give a tarbiyah (and an understanding: mala’ika (angels) are under the feet of Sayyidina Muhammadﷺ. They made a sajdatul ihtiram (prostration of respect) for Sayyidina Adam (AS) (Quran 2:34) – why? Because Nur al Muhammadﷺ. Where did Jibreel (as) brought the Wahy (revelation) from? قَالَ رَسُولَ اللَّه صَلَّى اللَّهُ عَلَيْهِ وَسَلَّمَ: يَا جَابِرُ ، إِنَّ اللَّهَ خَلَقَ قَبْلَ الأَشْيَاءِ نُورُ نَبِيِّكَ مِنْ نُورِهِ ، فَجَعَلَ ذَلِكَ النُّورِ يَدُورُ بِالْقُدْرَةِ حَيْثُ شَاءَ اللهُ ، وَلَمْ يَكُنْ فِي ذَلِكَ الْوَقْتِ لَوْحٌ وَلا قَلَمٌ ، وَلا جَنَّةٌ وَلا نَارٌ ، وَلا مُلْكٌ ، وِلا سَمَاءٌ وَلا أَرْضٌ ، وَلا شَمْسٌ وَلا قَمَرٌ، وَلا إِنْسٌ وَلا جِنٌّ. “Ya Jabir, in Allah khalaqa qablal Ashiya e Nooru Nabiyika min Noorehi. 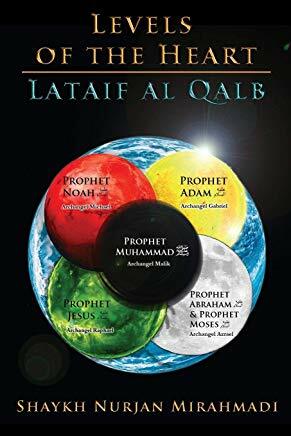 Faj’ala dhalikan Noore yadoro bil Qudrati haithu sha Allahu, wa lam yakun fi dhalikal waqti lawhun wa la qalamun, wa la Jannatun wa la Narun, wa la Mulkun, wa la samaun wa la ardun, wa la Shamsun wa la Qamarun, wa la insun wa la jinnun. 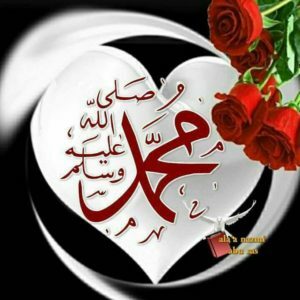 He (Prophet Muhammad (saws) said: “O Jabir, the first thing Allah created was the light of your Prophet from His (Allah’s) light, and that light remained (lit. 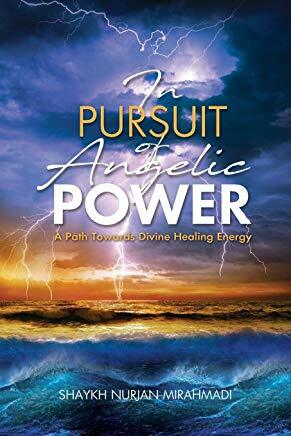 “turned”) in the midst of His Power for as long as He wished, and at that time, there was no Tablet and no Pen, and no Paradise and no Fire, and no angel, and no heaven and no earth, and no Sun and no Moon, and No Human being and no jinn. So means that what Allah (AJ) reveals of holy Qur’an to the heart of Sayyidina Muhammadﷺ, nothing can contain, nothing can hold that. So means in this dunya, through the heart of Prophetﷺ is coming Kitabullah. Why the holy Quran was Not compiled at the Time of Prophet ﷺ? What is the durood of Prophetﷺ? Awliyaullah want us to know it’s holy Qur’an, “’alim al kitabi wal hikmah” ‘He will teach you the book and its wisdom’ (Quran 2:151). Allah (AJ) says ‘feekum’, Allah (AJ) is describing that Prophet Muhammad ﷺ ‘feekum’, is with you, but you don’t have the eyes to see it. If you look through your heart Prophetﷺ must be right there.’ Every isharat Allah (AJ) gave to us, so if you don’t believe it you’re calling his name ﷺ in your adhan . If you don’t believe it, you’re praying in the form of Ahmad – alif, ha, meen, dal ﷺ. If you don’t believe it, in your salah you say, ‘Assalamu alaika ayyuhan Nabiﷺ,’ ‘Peace be upon you oh Prophet ﷺ‘, before you close your salah, you’re saying, ‘Assalamu alaika‘ in present tense. Means the soul is in the present facing Prophetﷺ. Wherever you look is, “Wa ma arsalnaka rahmatan lil ‘alamin.” ‘We didn’t sent you, except as a Mercy to creation’ (Quran 21:107) So Allah (AJ) say, ‘Why you want to deny My Rahmah. My Rahmah is Sayyidina Muhammadﷺ. 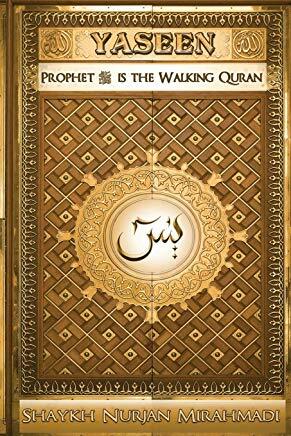 If you don’t have Prophetﷺ, the book you’re reading is furqan,’ and is very dangerous books, because it has no rahmah. So when you’re seeing and what watching around the TV, they’re reading the same book; but for them it’s furqan. They have no “wa ma arsalnaka,” they have no love for Sayyidina Muhammadﷺ. Without the love of Prophetﷺ, it’s all about kill this one slay that one, burn this one. It’s a formula, Allah (AJ) said, ‘Don’t ever leave that formula. Keep My Book and the love of Sayyidina Muhammadﷺ, it becomes the rahmah of that and becomes the reality of Qur’an.’ What we have is furqan. Oh, this kitab is going to be very dangerous, because this child going to be raised now on furqan, very hard. Everything is about killing and destroying, nothing about rahmah; you left out the formula. Allah (AJ) say, ‘I would not have sent the reality,’ because of His Love for Sayyidina Muhammadﷺ, “wa ma arsalnaka rahmatan lil ‘alamin.” If you leave the rahmah, then you don’t have what Allah (AJ) wanted for us of holy Qur’an. So you have furqan, with Prophetﷺ is Qur’an, in the heart of Sayyidina Muhammadﷺ, in the heavens is Umm ul Kitab ام الكتاب. Umm ul Kitab- ام Alif, Meem– . [Alif- ‘Izzatullah, Meem – Muhammad ﷺ] nothing comes into that. Allah (AJ) describes that in Surat al Yaseen, that, ‘My Amr امر and My Iradah (Will) is in the heart of Prophetﷺ.’ The Amr (command) is what’s known, is Qur’an; Iradah and the Will of Allah (AJ) is in Umm ul Kitab. Means everything is in the Haqa’iq (realities) of Sayyidina Muhammadﷺ. Means, ‘Everything I’ve given of Qur’an and hikmah is in this reality of Yaseen ﷺ. “Tanzilal ‘Azizir Raheem,” that his reality and his soul ﷺ – what Allah (AJ) tanzil (was sent down)? Did the kitab came by itself and was thrown down? 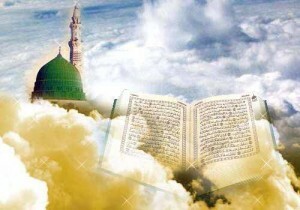 The soul of Prophetﷺ tanzil, the milad, the soul of Prophetﷺ came from paradise realities with what – loaded with holy Qur’an, the book of Allah (AJ) that no nation had, and contains every book within it. Allah (AJ) says, ‘If the book that can raise the dead, this is the one.’ (Quran 13:31) That everything and every praise is written in this holy book. We pray that Allah (AJ) dress us and bless that; that’s Mawlid an Nabi,ﷺ is that Allah (AJ) dress us from Qur’an, dress us from light, dress us from ma’rifa, dress us from every reality, bi barakat Muhammad al Mustafaﷺ. 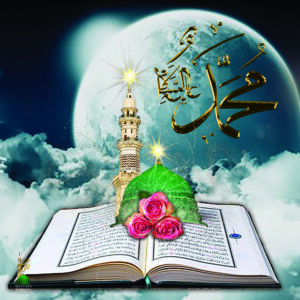 Bi hurmati Muhammad al Mustafa wa bi sirri Surat al Fatiha. 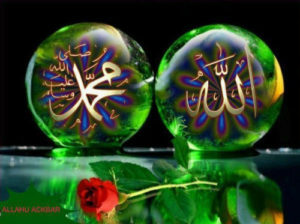 The Birth of Prophet Muhammad (s) is the Birth of Creation.